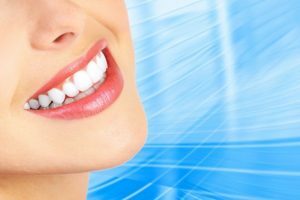 Discolored teeth are problematic in terms of smile quality. However, teeth stains can also cause related health problems or at least contribute to such problems. So do not assume your discolored teeth are a problem insofar as they reduce the quality of your smile. Discolored teeth have the potential to impact your health as well. Inadequate oral hygiene or the failure to visit with the dentist every six months will cause the teeth to yellow in hue. Plaque and tartar will accumulate, causing tooth decay, gum disease and more oral health issues. Discolored teeth often contain cavities. Cavities are tiny holes in teeth that damage their structure. Discolored teeth can also cause gingivitis, which involves bleeding and inflammation of the gums. Periodontitis occurs when bacteria along the teeth generate harmful toxins that damage the gums. Discolored teeth and halitosis go hand-in-hand. Halitosis, also known as bad breath, occurs when bacteria is permitted to grow within the mouth. This bacteria has the potential to cause everything from teeth staining to dry mouth, sinus infections, bronchitis, liver or kidney issues, acid reflux and other conditions. Poor oral hygiene that causes discolored teeth can also lead to the formation of abscesses. Abscesses that form along the teeth, spur considerable pain and difficulty, especially when chewing. Aside from the oral health issues noted above, discolored teeth can also indicate a number of additional health problems. In some cases, discolored teeth are a lead-in to another health condition, disease or malady. As an example, discolored teeth are often a sign of celiac disease. This is a disease in which the immune system interacts with gluten. People who have diabetes, typically have a weak immune system. A weak immune system makes a person that much more susceptible to gum disease. If gum disease does not receive proper treatment, it will cause periodontal disease. Periodontitis makes it challenging to control blood sugar. The failure to control blood sugar makes it that much more likely for an individual to develop type-2 diabetes. Once the gums weaken, it is easier for bacteria to move into the bloodstream and impact the immune system, causing higher blood sugar levels and other problems. Teeth will yellow if the individual does not eliminate the stains in a timely manner. Stains remaining on the teeth are essentially bacteria that stays in the mouth and causes gum disease, lung issues, etc. In fact, lung infections will worsen if the teeth remain discolored. This is especially important for elderly individuals who might end up with pneumonia after bacteria from the teeth compromises the lungs.